You'll be £25.00 closer to your next £10.00 credit when you purchase A Steam Engine Pilgrimage. What's this? Anthony Burton has travelled from the Highlands of Scotland, to the south west of England in pursuit of his passion for the steam engine in all its different forms. He has travelled on narrow gauge railways in Wales and enjoyed the splendour of main line journeys behind some of the grandest locomotives ever built. He has shovelled coal into the boiler of an old Clyde Puffer, while steaming down Scotland’s west coast, and luxuriated in the elegance of a Windermere steam launch. He has marvelled at the magnificence of the great Victorian pumping engines and their elaborately decorated engine houses – and spends time every year helping to oil and polish an old mill engine to get it ready to receive visitors. He has revelled in the fun of the steam fair and shared a ride in a replica of Richard Trevithick’s extraordinary steam carriage with a direct descendant of the great engineer. All these experiences and more are brought together in this lively narrative, in which the author shares his own sense of excitement and places each visit within its historical context. Above all, this book is a tribute to all those anonymous volunteers whose hard work and dedication have kept this great tradition alive. I loved the travel portions of this book, I loved seeing parts of Europe I haven't been to. This volume is an easy read and well-written. It will inevitably appeal to readers who work on the various ‘preservation’ sites that appear within it. By outlining what each site is doing, it may also give direction to potential visitors wishing to see item ‘A’ but not ‘B’. .Readers unable to visit these sites may also gain some appreciation of the work that is being are undertaken. This is a ‘happy’ book and well worth inspection. A nostalgic look at when steam was king! And of pockets throughout the country trying to keep it alive. A very enjoyable read. 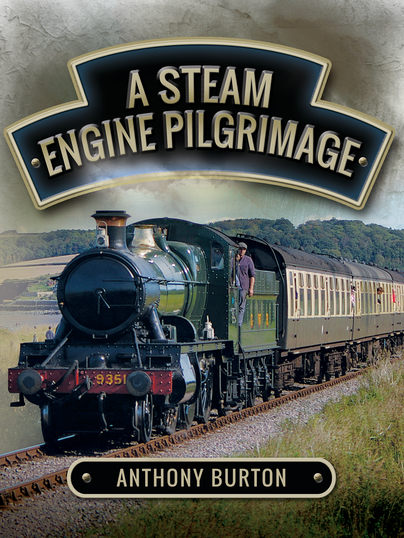 This book is a second edition to a book titled Steaming Through Britain that was published around twenty years ago. Designed for those of us who love the sound of the old steam engines that still exist willfind this book very interesting. The text within this book was basically not changed but updated. Also the addition of areas that made the steam engine’s pilgrimage more complete was readily welcome. The setting is in Britain where the steam engine was the workhorse and the journey begins. A map at the beginning of the book will let you visualize the basic settings where stations are located. Pictures included sparsely between the text will allow you the ability to see these great Ironhorses of early days and items that apply to them. This would be a wonderful gift for a train lover and also for those who lived in Britain or have relatives that may have shared stories of this time and age.